There is a lot of chatter "out there" about the value of Omega 3's...well...I agree with that chatter! BUT, quality of the Omega 3's you take varies significantly! There are several brands that trust, including, of course, Young Living's OmegaGize. Young Living's Omega 3 are, of course, enhanced with essential oils and they add a different value to your body. TIP 1: Top tip or reason for taking OmegaGize...depression. I don't care if you are suffering postpartum depression or depression from challenges in life; omega 3's are of significant value to elevating your serotonin levels helping alleviate depression. TIP 2: Omega 3's are of significant value to the pregnant momma and her unborn baby. They are very beneficial to the development of the growing brain in that little baby...and they help mom with stresses she may be experiencing in life. TIP 3: Omega 3's are also very beneficial for the heart. TIP 4: Your joints take a beating in life and omega 3's are beneficial to their health, possibly helping ease stiffness, achiness and soreness. TIP 5: Omega 3's are "essential fatty acids" meaning they are essential for life...a healthy life. This also means they are not something your body can manufacture; it must be taken in through our diet. At one time, our food was very rich in Omega 3's, but sadly this isn't as true today and supplementing them is necessary. 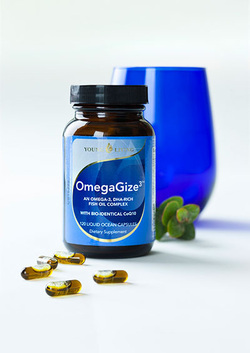 So along with being beneficial to the growing baby's brain in momma's belly, OmegaGize is of real value to the child and adult in maintaining their brain health!